Phegley, a 6-foot-7 athlete who could do it all - play guard, forward, rebound, score from in close or from outside - was both a basketball and baseball standout at East Peoria High School. As a pitcher, he played a major role in East Peoria's making the state baseball tournament for the first time. He then entered Bradley as a walk-on basketball player and a right-handed pitcher. He would pitch for BU, but very little. Instead, he became almost an instant basketball standout who would score 2,064 points in 103 games for a 20.0 average before he was finished. Phegley, playing in the 1975-78 era, was Bradley's all-time scorer until Mitchell Anderson produced 2,341 points. Anderson's average was slightly less at 19.2 because he played in 19 more games. 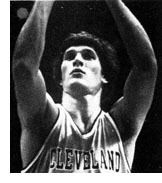 During his BU career, Phegley was named an All-American by Converse in 1978 and a third-team choice by the Associated Press and United Press International. He was Missouri Valley Conference Player of the Year in 1977, and was an all-Missouri Valley Conference selection in 1977 and 1978. Drafted by Washington of the NBA, Phegley also played for New Jersey, Cleveland, San Antonio and Dallas, ending his career by playing in France. Now living in Morton, he is an insurance agent with offices in Peoria.